The parade of frogs to the breeding ponds begins soon after the ice is out (usually after April 15th), as they fulfill their yearly mating ritual. In the spring I try to spend as much time as possible in the local frog ponds. Although it may seem gross to be slogging around a mucky pond, it is actually very healing. It is a world unto itself: the frogs calling; dragonflies darting around; and red wing blackbirds calling from the cattails. All you need is a decent pair of waders or rubber boots and a walking stick to keep from falling in the water. 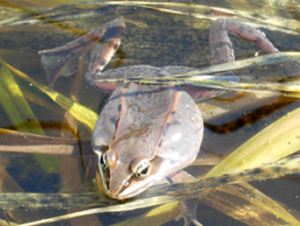 Wood Frog – The wood frog is 2-3 inches, brown with a black eye line. They are a woodland frog that spend the winter in the leaf litter. They freeze solid over the winter, but their internal organs are protected by glycol, an antifreeze chemical. This frog is usually the first to visit the breeding ponds. They are very quick breeders, often only staying at the pond for two weeks. While breeding, the males aggressively move about their territories. The male’s call is a “clucking” type sound, similar to a chicken. Gray Tree Frog – The gray tree frog can change colors from gray to green depending on its surroundings. They are two inches in size and have small suction cups on their feet which allows them to climb on windows and in to the treetops (over thirty feet). Gray tree frogs overwinter under leaves on the ground. Their body completely freezes like an ice cube or “frog cube”. The frog survives by filling major body organs with an “anti-freeze” substance. 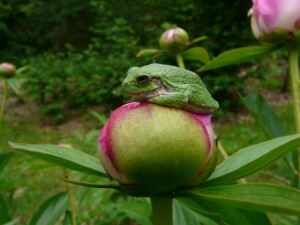 Tree frogs breed in mid-May in woodland ponds. After leaving the ponds, they feed on insects living in shrubs and trees. 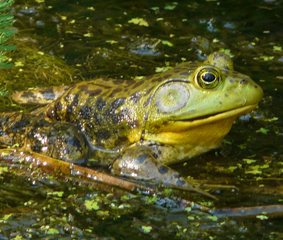 Bullfrog – Bullfrogs can reach up to eight inches and are the largest frog found in Minnesota. Bullfrogs are a game species and are hunted for their tasty legs. They do not naturally occur in the Twin Cities, but have been introduced in many areas of the state. Bullfrogs breed later than most frogs, in June and July. The call of a male bullfrog sounds like someone plucking a banjo string. Tadpoles take one to two years to metamorphose. Young frogs take 2-5 years to develop into adults. Bullfrogs are rarely found far from water. They will eat any of the native species of frogs and have caused the population of native frogs to be lower in areas where the bullfrog has become established. Bullfrogs will eat anything that they can fit into their mouths, including: worms, insects, small turtles, snakes, bats, mice, and ducklings. Predators on bullfrogs are raccoons, mink, pike, bass, and humans. 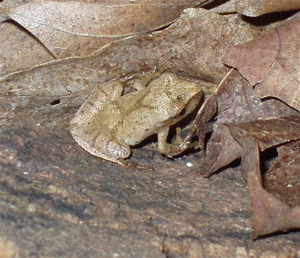 Spring Peeper- Spring peepers are the smallest frogs in our state. They are approximately one inch in size. They are brown in color and have a distinctive “X” on their back. 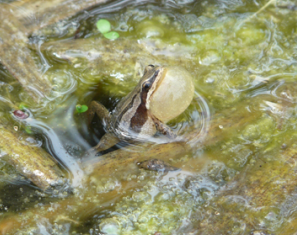 Peepers are woodland frogs and are uncommon in the Twin Cities because they like a natural setting without humans. Housing developments and roads have caused spring peeper populations to be reduced because of loss of habitat. In the spring, peepers come to the ponds and make a “peeping” call that sounds like a chick. A pond full of spring peepers calling can be overwhelmingly loud. Leopard Frog – The leopard frog is the most well known of all Minnesota frogs. It is a large green frog, three to four inches in size, with many black spots. Leopard frogs are exceptional jumpers. Leopard frogs spend the winter buried in the mud in lakes. 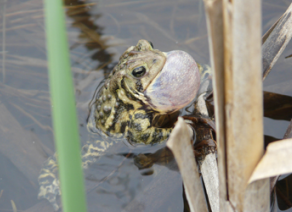 When the ice thaws, leopard frogs migrate to their breeding ponds. Many are killed as they cross roads at this time of year. They begin breeding in late April. The males make a low snoring call to attract females. Leopard frogs complete their breeding in only two to three weeks, but remain near the water or in wet meadows throughout the summer. Leopard frogs feed on insects and worms. Herons, raccoons, snakes, and owls feed on leopard frogs. Humans use leopard frogs for fishing bait, and many are killed by mowers and cars. 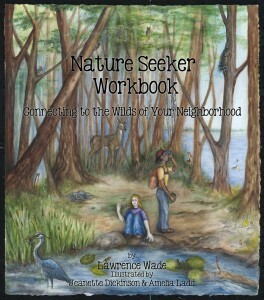 This entry was posted in Connecting to Nature, Spring. Bookmark the permalink.